BOSTON – Oct. 30, 2018 – Crayon, the market and competitive intelligence platform company that enables businesses to track, analyze, and act based on market movements, is arming sales teams with dynamic Battlecards integrated with Salesforce CRM and the world’s first real-time, programmatic competitive intelligence engine, the largest source of real-time competitive intelligence. 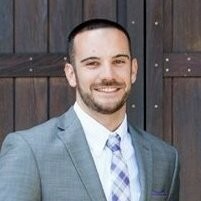 Crayon monitors more than 300 million pages across 7.6 million domains and 2.4 million companies, and applies algorithmic and machine learning techniques to synthesize and extract actionable competitive intelligence insights for customers. "We compete against a variety of providers across a range of size and sophistication. As product marketer, keeping track of these competitors as the market changes, and arming our sales team with accurate and relevant information is a huge undertaking. Crayon enables me to share the right information on our competition in a way that helps our team win more." "Sales battlecards are only as good as the data behind them, and Crayon is already best-in-class at tracking and delivering actionable, real-time intelligence,” said Ellie Mirman, CMO at Crayon. 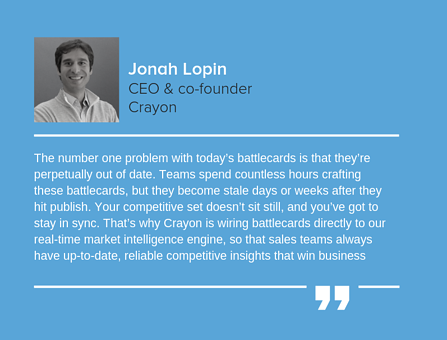 “Crayon Battlecards are a natural extension of our flagship market intelligence platform, enabling businesses to get the best, up-to-date intelligence in front of their sales team to win more competitive deals, while alleviating the traditionally laborious sales battlecard process." Crayon’s market and competitive intelligence platform enables businesses to track, analyze, and act on market movements from their competitors, customers, and partners. Tens of thousands of teams use Crayon’s software to capture and analyze complete market intelligence - external messaging and positioning, product and pricing changes, hiring plans, partner strategies, and more - pulling from more than 7 million sources. Crayon was founded in 2015 by former HubSpot and AdMob executives to enable millions of businesses to take advantage of valuable market intelligence data to drive opportunities and revenue. To learn more about Crayon, or request a free sample market intelligence report, visit www.crayon.co.